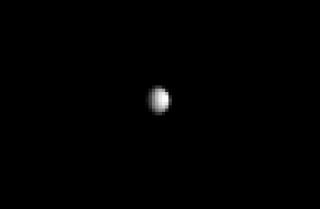 Zoomed-in image of the dwarf planet Ceres captured on Dec. 1, 2014 by NASA's Dawn spacecraft captured this photo of the dwarf planet Ceres, from a distance of about 740,000 miles (1.2 million kilometers). The dwarf planet Ceres is starting to come into focus for a voyaging NASA probe. NASA's Dawn spacecraft, which will enter orbit around Ceres in March 2015, has captured its best-ever image of the unexplored dwarf planet, the largest body in the main asteroid belt between Mars and Jupiter. "Now, finally, we have a spacecraft on the verge of unveiling this mysterious, alien world," Dawn mission director and chief engineer Marc Rayman, of NASA's Jet Propulsion Laboratory in Pasadena, California, said in a statement. "Soon it will reveal myriad secrets Ceres has held since the dawn of the solar system." Dawn captured the new, nine-pixel-wide photo on Dec. 1, when it was about 740,000 miles (1.2 million kilometers) from Ceres — roughly three times the distance between Earth and the moon. The image, which was snapped to help calibrate Dawn's science camera, is not the sharpest ever taken of Ceres; NASA's Hubble Space Telescope has resolved the dwarf planet more clearly. But Dawn's Ceres images will begin exceeding Hubble's resolution early next year, NASA officials said. NASA's Dawn spacecraft acquired this image of the dwarf planet Ceres on Dec. 1, 2014. A cropped, magnified view of Ceres appears in the inset at lower left. The $466 million Dawn mission launched in September 2007 to study the two biggest objects in the asteroid belt, Ceres and the protoplanet Vesta, thereby revealing insights about our solar system's planet-building epoch nearly 4.6 billion years ago. Ceres is the only one of the solar system's dwarf planets that lies in the asteroid belt. The rest, such as Pluto, orbit much farther away, in the icy Kuiper Belt beyond Neptune. Ceres intrigues astronomers for many reasons; for example, it's known to harbor water, which erupts into space, perhaps from "ice geysers" on the object's surface.